China is midway through its decades-long South—North Water Transfer Project, a massive system of aqueducts intended to convey 44.8 billion m3 (11.8 trillion gal) of fresh water each year from China’s rural, rainy south to its drier and more urbanized north. However, the country also is exploring far-reaching ways to use stormwater as the basis for innovative water supply projects. Despite typically receiving less than 10 cm (4 in.) of rain annually, the high-elevation glaciers and natural reservoirs surrounding the Tibetan Plateau in northwestern China represent one of the most crucial sources of freshwater in Asia. China’s state-owned Aerospace Science and Technology Corporation (Beijing) is in the early days of a partnership with Tsinghua University (Beijing) and the Plateau-adjacent Qinghai province to test the use of experimental military technology to increase rainfall in the region, reports the South China Morning Post. The initiative, which has yet to receive full approval from the Chinese government, would build thousands of specialized fuel-burning chambers on the slopes of the Himalaya Mountains. When a network of 30 weather satellites monitoring the Indian Ocean detects strong, cool, land-bound winds, the chambers would ignite, producing silver-iodide particles. When winds from the ocean hit mountainsides, researchers expect those winds to draft upward into the clouds, bringing aerosolized silver-iodide with them. When cooled by incoming winds, the particles create rain or snow in a process known as cloud-seeding. Researchers working on the project, who spoke with the South China Morning Post on the condition of anonymity, said the cloud-seeding chambers would increase rainfall over an area of 1.6 million km2 (620,000 mi2) if fully implemented — an area about three times the size of Spain. After installing 500 proof-of-concept chambers in the region, early estimates by the researchers place additional precipitation at up to 10 billion m3 (2.6 trillion gal) annually when the system is fully operational. That amount would be equivalent to about 7% of China’s total water consumption. At a price of about US$8000 per unit, cost-effectiveness is just one benefit China’s cloud-seeding endeavor boasts over similar experiments in other countries. Unlike cloud-seeding via specialized airplanes, for example, the Tibetan Plateau network would not require the establishment of a no-fly zone. The network could also be operated from thousands of miles away via a smartphone app, the researcher said, adding that improvements already made to the installed units allow them to burn without human intervention for up to months at a time. However, critics have argued that cloud-seeding on such a scale is still unproven, and even that the plan may backfire by contributing to climate change rather than mitigating its effects. The underlying technology beneath the fuel-burners, primarily used to launch rockets into space, produces carbon dioxide in addition to silver iodide. For its part, the Chinese government also is reportedly concerned that increasing precipitation above the plateau could mean decreasing precipitation elsewhere, according to the South China Morning Post. Shanghai, China’s most populous city, is installing 400,000 m2 (4.3 million ft2) as part of a sweeping, nationwide green infrastructure initiative. 29 other Chinese cities are also looking at green infrastructure to manage stormwater under the central government’s Sponge Cities Initiative. China’s Sponge City Initiative seeks to build a massive amount of green infrastructure throughout the nation to better control existing runoff and refill its stressed aquifers. Beginning in 2015, 16 Chinese cities of varying sizes were selected as pilot sites to test new policies, regulations, and innovative low-impact designs for stormwater management. By 2016, the pilot group had widened to 30 cities, including Shanghai, China’s most-developed urban center. By 2020, China’s Ministry of Housing and Urban-Rural Development, Ministry of Finance, and Ministry of Water Resources expect 20% of the developed areas in pilot cities to capture, reuse, or absorb at least 70% of all the precipitation they receive. By 2030, 80% of each city should meet this threshold. For sponge cities, the central government funds only up to about 20% of all project costs. Municipal governments and the private sector are expected to come up with the remainder, leading some cities to experience more success than others under the program. In Shanghai, the program already is showing considerable results. The city government is 2 years into a campaign to construct 400,000 m2 (4.3 million ft2) of rooftop rain gardens throughout the city’s most developed areas. Many sponge cities already are urbanized and require green infrastructure retrofits, but in the planned city district of Lingang, city planners can build sustainably from the beginning. 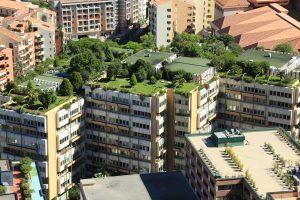 New buildings are constructed with green rooftops and roads are paved with materials that rainwater can permeate. Manmade lakes help retain and manage excess water during heavy rains while rain gardens discourage roadway flooding and add to the beauty of the district. The Lingang city government already has invested US$119 million in green stormwater management infrastructure, CNN reports.